A Moody Broadcast Network station in Texas recently dropped David Barton’s radio broadcast “Wallbuilders Live.” The reason was his defense of Glenn Beck. Three bits of information are important to understand this action. First, David Barton is an American evangelical minister, conservative activist, former co-chair of the Republican Party of Texas, and founder of WallBuilders, “an organization dedicated to presenting America’s forgotten history and heroes, with an emphasis on the moral, religious, and constitutional foundation on which America was built” (the quote is from their website). 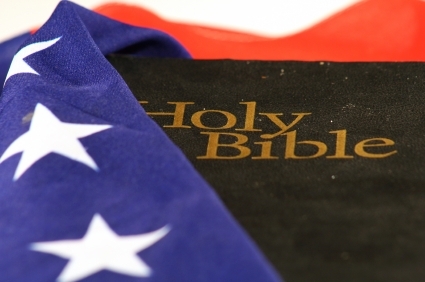 Their goals include educating the nation regarding its godly foundations, developing public policies that reflect biblical values, and getting Christians involved in the public arena. I heard Barton speak seventeen years ago at a “God and country” conference, but honestly I don’t remember what he spoke on. Second, popular radio show host Glenn Beck is an avowed Mormon. This faith that he embraces believes in the principle of continuous revelation which means their canon of Scripture includes not only the Bible, but also the Book of Mormon, and writings by Joseph Smith, and they believe the latter writings are more accurate than the Bible. Beck’s religion believes that there are many gods and that God used to be a man on another planet before he became God. Mormons believe that God is married to a goddess wife and has spirit children, the eldest of which was Jesus who was born in heaven and came to earth on a redemptive mission. Mormons believe that Jesus and Satan are spirit brothers. More could be said, but that is enough said. Mormons want to be considered Christian, but 1 John 4:1-3 forbids it. Third, while discussing Glenn Beck on his recent radio broadcast (9/13), David Barton said that he believed Beck was a Christian because of his confession that “the Lord Jesus Christ is my Savior and my Redeemer.” If you understand Mormon belief, you will realize that Beck’s confession is consistent with his Mormon beliefs. Beck may have confessed Jesus as his Savior and Redeemer, but the Jesus he confesses is not the Jesus John was talking about in his gospel or his letters. In endorsing Beck’s confession as a true Christian confession, Barton was either ignorant or recklessly ignoring a huge theological chasm in favor of political comraderie. Barton’s endorsement of Beck’s confession as “Christian” is contrary to the gospel. As much as Mormons want to be considered “Christian,” they are not and we betray the true gospel if we act like they are. You can read about it here. I applaud the Moody station for cancelling the program. As if that wasn’t enough, along comes Pat Robertson, televangelist, host of the “700 Club,” founder of the Christian Broadcasting Network, the Christian Coalition, and the American Center for Law & Justice (a conservative Christian pro-life group), former Republican presidential candidate, and recognized leader of the Christian Right. I’ve never been a Robertson fan. Just last week Robertson surprised (the report I read was “stunned”) his viewers by endorsing a friend’s decision to date another woman while his wife was still alive and suffering from Alzheimer’s. Robertson chided that we ought not to put a “guilt trip” on someone divorcing a spouse with Alzheimer’s because, according to Robertson, Alzheimer’s is a kind of death, and marriage vows are only until “death do us part.” Check the story out here and here. Robertson’s statement is an affront to God’s design for marriage and simply adds fuel to those who want to make marriage something other than what God has made it to be. Two leaders of the religious right in one week making statements contrary to God’s Word? The religious right is going wrong. This entry was posted in Uncategorized and tagged Christian Right, Gospel, Mormons, Politics. Bookmark the permalink. You have no real understanding of Mormon doctrine and it shows here. This was not a dissection of Mormon doctrine, and yes, there is much about their beliefs I do not understand. However, I stand by my comments regarding their beliefs, especially regarding Scripture and the person of Jesus Christ.